There is nothing more seductive smelling, no perfume, no mushroom, no wine, than the scent of hardwood smoke after it has tickled spice rubbed pork. And I don't think I'm alone in that opinion. You can make damned good smoked meats on an all-purpose charcoal grill (click here for tips on smoking on a charcoal grill) or gas grill (click here for tips on smoking on a gas grill), but to make the most amazing ribs, salmon, or pulled pork, a specialized smoker is the way to go. What to buy? Ohhh, there are sooooo many choices! With a high quality modern barbecue smoker you no longer need to hover over your machine for five hours, constantly monitoring the temp, fiddling with the dampers, shoveling coal, adding wood chips, and spritzing your meat with a mist of secret moisturizer. A good smoker means that you can win the battle against creosote, soot, and ash. With a good smoker you can get your food on the table on time and not fear that it is over- or under-cooked. Here is a checklist of what to look for before you buy. There are many different types of home smokers. Below are links to the pages that discuss and review them all. Bullet style charcoal smoker. You can get cheapos for under $100, but they are a real pain to operate and produce consistently good food. 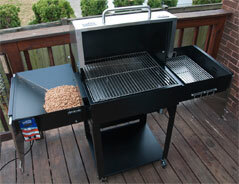 The most popular is the Weber Smokey Mountain (below). They usually have water/drip pans between the charcoal and the food to help regulate heat and add humidity. The WSM comes in two sizes for about $275 and $400 and I highly recommend them. Click here for my reviews of Weber Smokey Mountains. Offset side firebox barrel type charcoal smoker. This macho looking style is very popular, but the cheaper models, like the CharGriller Smokin Pro (below) for under $200, are a real pain to operate properly. More reliable high end units like the the Horizon run $700 to $2,000. Several are listed on my charcoal smoker review page. Cabinet style charcoal smoker. These open in the front like a refrigerator. That makes them very easy to use. The better models are very tight and well insulated. The newest and one of the coolest is the Onyx (below) for about $1,000. Several others are listed on my charcoal smoker review page. There are also some nifty gas fired cabinets that sell for about $150. They work very well. 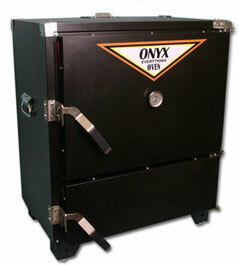 Pellet smoker/grills. This new generation cool tool has a digital thermostat control and it burns pure hardwood sawdust compressed into pellets. Surprisingly, the smoke flavor is milder than charcoal smokers. But nothing beats them for convenience and ease of use. The MAK 2-Star, below is my fave and it sells for about $2,000. Stovetop smokers. There are a few simple devices that you can use on your stovetop indoors or out. Sawdust goes in the bottom and it smolders producing a delicate smoke flavor, and a lot of noise from your smoke alarm. You better have a good hood before you buy one of these. This is my fave, from Emirilware. Trailer mounted rigs. If you want you que to go, why not get a trailer mounted smoker? Price. What is the bottom line? Prices range from $50 for cheapo charcoal bullet-shaped cookers up to $5,000 for all-in-one smoker/grills for your patio. Make sure to ask if there is a shipping charge or if there is sales tax. Temperature control is the most important thing to look for. For most folks, getting great food on the table that is not over- or under-cooked makes you look cooler than standing over a hot smoker jiggling the dampers and feeding it lumber. Delivering the meal on time is more important to your spouse and guests than paying homage to your heritage by cooking with George Washington's cherry tree. That's why, first and foremost, you should look for a smoker that makes it easy to control temperature. The problem is that damn few outdoor ovens have that most basic standard equipment feature on every indoor oven: A thermostat. 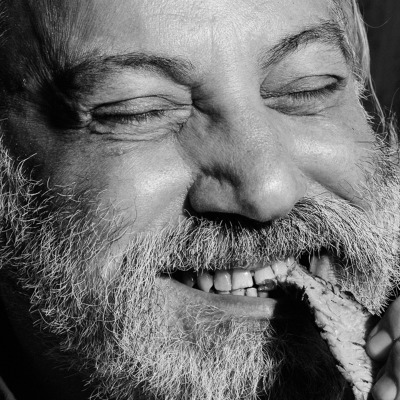 Electric smokers have thermostats, and they work great on fish and some other foods, but, frankly, I just don't like the flavor they give ribs and other smoked meats. That's because the heat does not come from combustion in an electric smoker (click here for more on electric smokers). Gas cookers produce great flavor, they are fairly easy to set and forget, and they are cheap. Yes, the flavor is slightly different than the flavor produced by a charcoal smoker, but it is still delicious. 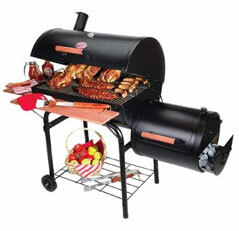 I recommend them, especially if you are on a tight budget (click here for more on gas smokers). 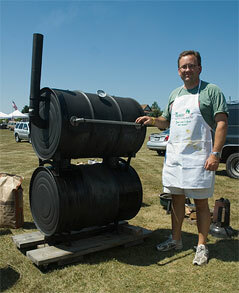 If you dream of competing on the barbecue contest circuit, you must cook with wood or charcoal. Most competitions don't allow electric or gas smokers. They're too easy. The notable exception is South Carolina where gas and electric cookers are allowed. For competitions, the easiest way to go is with a pellet smoker. They are legal because pellets are made from pure wood sawdust. Best of all, they are thermostat controlled so you can deliver meat that is perfectly done right on time. Some are also good for grilling (click here for more on pellet grills and smokers). Charcoal and wood burners need to be built very well in order to manage the temp. If you're going with charcoal or wood for fuel, get a unit that is made of heavy gauge steel or one that is insulated, make sure it is tight, and that it has a good system of dampers, especially the air supply to the fuel. A great option is to buy Rock's Stoker, a thermostatically controlled blower that controls the oxygen supply to fire boxes (for more on charcoal and wood smokers, click here). Insulation and seals. It's an axiom: Cheap units leak. Your heat and smoke escape. And that makes it hard to stabilize temperatures and manage the amount of smoke flavor. So study the insulation, seals, welds, and thickness of the metal before you buy. Leaky smokers can still produce great food, but the results are just a bit less predictable. Materials, workmanship, and durability. How heavy is the metal? Heavy steel holds and distributes heat better than thin steel. This is especially important in cold weather. Is the metal thick enough that it will not warp? How are the welds? Does it have sharp edges? Sturdy legs and wheels? Big hinges and latches? Is the paint going to remain waterproof and rustproof? Do the moving parts look like they'll last? Some thoughts on stainless steel: It shows dirt, dust, grease, and rainspots. If you are a neat freak you'll go crazy polishing your smoker. It's a barbecue for cryin' out loud. Who cares if it's dirty on the outside? Also, stainless tends to be thinner and provides less heat retention and it is more expensive. Skip it. Thermometer. You need a high-quality thermometer and if you buy one of those long barrel shaped smokers with a separate firebox hanging on the side, you need two thermometers at grate level, not high in the dome, because the temp on the left and right can be very different. The sad fact is that most grill and smoker builders skimp on thermometers and they are usually totally unreliable. I have seen them off by as much as 50°F. Plan on buying a good digital thermometer or two. Click here to read my buying guide to thermometers. Oh, and by the way, I do not recommend inexpensive offset side firebox barrel smokers. They look cool, but they are a real pain and they have ruined many meals and cooks. Click here to read more about the modifications people are forced to make to get their offsets to do what they want. Even heat. Sometimes there is a large difference in temp in the unit, especially with those side fireboxes where it can be 50 to 75°F hotter near the firebox than on the opposite side. Is the temp the same at the top as at the bottom in the cabinet or bullet? Temperature range. Can you crank it to 350-500°F for cooking turkey? Can you drop it down to 100°F for smoking cheese? Dampers. With wood and charcoal cookers, we control the heat by cutting back on the oxygen supply to the fire. To do this, we need to have a damper on the firebox and another on the chimney. Accessories. Does it come with a cookbook? Cover? Rib hooks? Tool hooks? Do you need a cold-smoking baffle? What do they cost? Warranty and support. What kind of warranty and/or guarantee does it come with. What is the dealer's reputation? Is there a phone number and email for tech support? Is the website informative? How about the manual? What if you need parts? How long have they been in business? Safety. Child and pet safe. Are electrical parts safe from rain and snow? Cool handles are cool. Wood handles disintegrate quickly. Coiled stainless handles are the best. Access. Look for easy access to the firebox to add fuel if you buy a charcoal or wood smoker. If you use chips, chunks, or pellets for smoke, you will need easy access to the place they go. Most important, you want access to the food. Front-loading, cabinet-style smokers give you much easier access to all shelves than top-loading bullet-style smokers. Capacity. If all you cook is an occasional slab of ribs for you and your spouse, then a small bullet will do the job. But if you throw an annual Fourth of July party, you may need more capacity. Footprint. A bullet shaped smoker will only take up a space of about 3' x 3', allowing for a little space around it. That means it will fit on a balcony. On the other hand, an offset pit can take up 9' x 4' plus space around it. Don't forget that you need plenty of space around your smoker. And ventillation. Wide enough for long slabs of ribs. Some slabs can run up to 16". If the racks are narrower you may have to trim the slab or cut it in half. They'll still taste good, but the edges tend to get a bit overcooked so there will be a bit more overcooked meat if you have to cut slabes in half. If the shelves are square or rectangular, measure the diagonal. Tall enough for large turkeys. You will want enough room to smoke a turkey, so make there is enough headspace between a rack and the top of about 1'. Wheels. You may want to move the thing when you set it up, perhaps to store it over the winter, so it should have wheels or it should break down easily. If it has wheels, how sturdy are they, and are they large enough to roll smoothly on a rough surface such a deck, concrete, pavers, or the lawn? Grill. Some offset cookers have a rack that allow you to use the firebox as a grill. Some bullets can be easily converted to a brazier by removing the water pan. This is a nice feature. If there is a brazier, can you control the heat? Can you move the fire closer to or away from the meat or move the meat closer to or further from the fire? Moveable shelves. It's nice to remove shelves to adjust the interior configuration so it can handle large slabs of ribs, half slabs, or pork butts and even large objects like turkeys. Removeable shelves also make cleanup easier. Can you add fuel, wood, water, and check the meat without losing much heat. Peeking at the meat is bad. It lets out heat. Every time you lift the lid to peak at your meat, to add wood or check the water, you add abou 15 minutes to the cooking time, and you mess with the humidity and smoke in the oven. If you're lookin', you ain't cookin'. So a good smoker should allow you to add charcoal, wood, and water without messing with the oven's environment much. This can be a real problem with bullets and cabinets. Look for units that let you do these tasks without disrupting the cooking environment. Water pan. 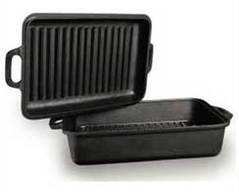 Many smokers, especially bullets, have a pan that is placed above the heat source. You can fill it with water, beer, wine, herbs, and whatever. The liquid moderates the temperature fluctuations in the oven. The moisture raises the humidity in the unit and helps keep the meat from drying out while the aromatics penetrate the meat, adding subtle flavor. The pan can also catch drippings, which can be used to make a sauce. The standard bowl is 5-6 quarts. The bigger the better. Drip pan. Fats and other fluids often drip from the food. Sometimes it is nice to have these liquids fall onto the fire and create steam and smoke. Sometimes it is nice to gather the drippings for sauces. Most of the time we just want to get rid of drippings, and a good smoker should have a way to collect them for disposal. Easy cleaning. Cleaning the exterior is optional. But cleaning the interior is not. If you invest in a shiny stainless-steel exterior, you'll probably want to cover it between uses and polish it so that it shines brighter than Uncle Bill's bald head. If you don't want the hassle, get the black finish and don't worry if there are bird droppings on it. The inside is another thing altogether. When you cook, fat, seasonings, and juices will drip off and splatter. They can become breeding grounds for bacteria. Cranking the unit up will kill most everything, but you still want to clean out all surfaces that come into contact with the meat. That means racks. Stainless is easiest to clean, plated grates will wear out with time and then rust. Will the grates, drip pan, and water pan will fit in your diswasher? Can you hose down the interior? How easy is it to remove ash? Will water get into the insulation or electronics if you hit it with a hose or power washer? Before you buy, study the unit and ask yourself how you will clean it and if you are willing to do it. If not, then you won't use it and you'll be wasting your money. Work surfaces and storage. Some cookers come with built-in tables and other work surfaces. You need these to put tools on, sauces, cutting boards, mitts, etc. The more work surfaces, the better. Some cookers also come with storage bins and cabinets for wood, tongs, etc. Those are also nice. Bottom line. Price is important, but temperature control is also important. Don't buy crap. What is your favorite smoked food?